I mentioned this in my earlier blog posts, but when I moved back to Manila from Cebu right after high school, I first lived with my grandfather at the Scout Area of Quezon City. Dining at the Scout Area didn't have the gems that are there today. In fact, if we wanted a decent meal, we would have to drive over to the bustling Tomas Morato Ave, where legendary restaurants, such as Mario's, Anabels' and the like still stand today. But to think of getting a delicious meal just walking distance from my grandfather's place was unheard of. Sadly, more than 20 years after moving out of that QC neighborhood, it has become quite a food haven. And as you may have it, I found an amazing hub just down the street for my Grandfather's house, called 2 Lazcano Place, which housed a charming little Filipino restaurant that I thoroughly enjoyed... Kusina Juan Republika. Two Lazcano Place houses several restaurants, and I had the pleasure of sampling a few during my visit. Much like the popular "Ketchup Food Community" in Baguio, the Two Lazcano complex allows cross ordering from all the restaurants, giving you a diverse selection to choose from, ranging from Japanese Food, American Food, Mouth-watering Pastries and of course, home grown Filipino food. Perched on the Second Floor of 2 Lazcano Place is a Kusina Juan Republika. The interiors are simple and homey, as this little restaurant let's their delicious Pinoy dishes speak for themselves. I'm called "The Pickiest Eater" for a reason, so there was no way I was going to try the Sizzling Balut (P190). Nonetheless, I have to give them props for coming up with an innovative way of serving the popular Pinoy Street Food. We were served two types of Sisig, Sisig ala Pampanga (P195) and Sisig ala Manila (P195). The Pampanga Style Sisig was made with grilled pork, then topped with fresh onions, minced chicken liver, and slices of fresh chili pepper. The Manila Style sisig was also made with Pork, and is a great version of the popular Pulutan that is making raves around the world. I preferred the Manila version because I have an aversion to chicken liver.. (Pickiest Eater.. Told ya). I'm a huge fan of Catfish, particularly when it's nicely seasoned and deep fried to a nice crunch. Just like how Kusina Juan Republika executed their Pritong Hito (P220). The fish was nice and juicy, with the exterior giving out a light crunch but keeping the meat white and pristine. I was totally surprised with how much I enjoyed the Pinakbet Rice with Seafoods (P180). It was simply amazing. When I eat Pinakbet (I sometimes do, believe it or not), I usually take the sauce and douse it into my rice, then mash the squash into it. This is a better executed take on my "habit", with the addition of squid and mussels into the mix. The highlight of the meal was most definitely the Krispy Pata (P495). This beautifully deep fried to a gorgeous crisp Pork Hock was then topped with toasted garlic bits mixed with finely minced Bird's Eye Chilis, adding a wonderful dimension of heat to your savory bite. Though it seems like Kusina Juan Republika is a new kid on the block, I assure you, they know Filipino food. 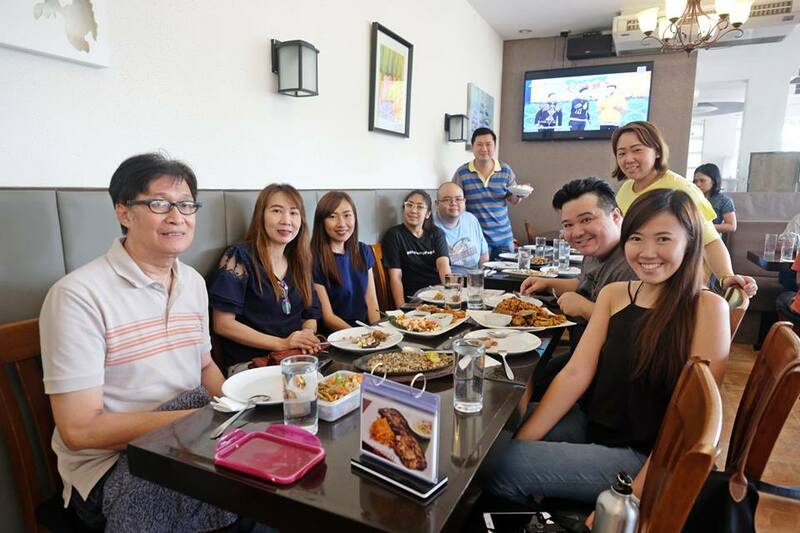 The people behind Kusina Juan Republika are the same people behind the success of Krocodile Grille, so you know they are legit. This was just the first stop in our tour of 2 Lazcano Place, and I'm so excited to show you what else you're in store for when you visit! Like Kusina Juan Republika on Facebook! Like 2 Lazcano Place on Facebook!